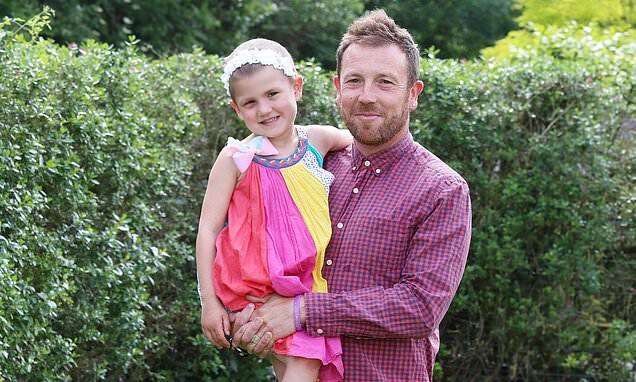 Polly Neville asks her little girl, Snowdrop, how she ‘tricked’ her friends after she lost her hair. The vibrant five-year-old dashes out of their kitchen and returns wearing a wig in the style of Elsa from the Disney film Frozen, with a long blonde plait. Then, with a toothy grin, she whips off the wig, revealing a crop of soft, pale brown hair, slowly growing back after chemotherapy. In October 2017, the Nevilles faced every family’s worst nightmare when, at the age of four, Snowy was diagnosed with rhabdomyosarcoma, a rare cancer of the skeletal muscles, most commonly in the head and neck. It affects four in one million children. Snowy had seemed well. But, when taking a ‘first day of school’ photo in September that year, Polly, a primary school teacher, noticed her daughter’s right eye was swollen. She’d had a butterfly painted on her face at the weekend, so Polly put it down to an allergic reaction. The GP referred Snowy to an eye clinic, who quickly referred her on to oncology. There, an ultrasound scan confirmed a tumour — and the possibility of rhabdomyosarcoma was mentioned. Snowy was immediately sent for an investigative procedure, during which doctors removed the lump. Then followed what her father, Mike, a chemistry teacher, describes as ‘the worst ten days of my life’ — the wait for a diagnosis. Neither Polly, 36, nor Mike, 39, who live in West Sussex, slept, and both felt a growing unease. On the day of the diagnosis, October 3, they were desperate for a distraction. ‘We went for a run — then we just kept doing it,’ says Polly. Exercise was to become not only a lifeline for Mike to channel his frustrations during Snowy’s treatment, but a charitable endeavour to help other families facing the same struggles with childhood cancer, too.